Built by Consolidated at San Diego. Assigned to the 43rd Bombardment Group, 403rd Bombardment Squadron. Nicknamed "Here T'is". When lost engines: R-1830-65 Serial Numbers: 42-91692, 42-9872, 42-36592, 42-89996. On April 16, 1944 took off from Nadzab Airfield (No 3) piloted by 2nd Lt Raymond A. Cooley on a bombing mission over Annenburg-Hollandia. Returning from the mission, the formation encoutered severe weather and the formation broke up and began flying on intruments. Pilot Cooley was instructed to take a heading for Saidor and proceed alone. He acknowledged and stated he was gaining altitude. This was the last radio contact. This B-24 was last seen 50 miles north of Faita at an altitud of 2,000' on a 90° bearing in bad weather. Whe this bomber failed to return it was officially declared Missing In Action (MIA). Afterwards, a search from Nadzab was made over the Ramu River and Sepik River, then returned via Gusap to Nadzab with nil sightings. In fact, this B-24 crashed at an altitude of 4,700' near Kunukio in the Finesterre Range. 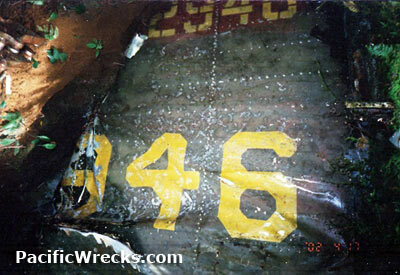 During 2001, the crash site was discovered only 700 meters from B-24J 42-100225 that crashed returning from the same mission. 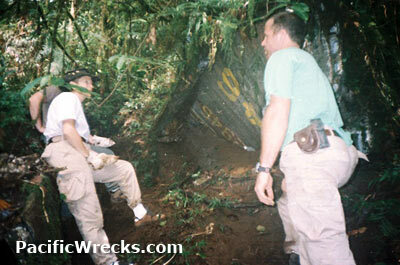 During 2002, a team from US Army CILHI with Brian Bennett visted the crash site designated PP46. "I found that the crash site search parameters had not been defined and we actualy found the tail turret outside the area of "official interest". A VIP from D.C. was there and he and I found the top turret next to a grid. This item had not been ID'd or flagged as a crew position. I found also a whole outer wing panel that niether CILHI nor locals had found. I don't have a lot of pics as i was only on site for about 4 hours. The reason for the short stay the day i went up was that when the weather started to close and there would then be a mad rush to get to the helicopter back down to the coast." Identification of the crew's remains was completed in December 2006 using mDNA and dental records. Remains of the crew were returned to their families in early 2007, resolving this MIA case. "My Dad’s uncle was one of the two crew, with enough identified remains to be buried individually. They will be conducting a full Military funeral at Arrington Notational this June 2007." "It was very interesting meeting the families from all over the USA who had come to attend the group burial at Arlington. The pilot's daughter (her mother was 4 months pregnant with her) attended the funeral. The co-pilot's son, who was about 4 when his father was lost was there. The navigator's daughter, who was 2 months old, at the time of her father's death and her mother attended with their family. The sister of the tail gunner, at about age 92 attended with her extended family. Then the rest of us were nieces, nephews or cousins of these lost men. It was in someway a sad event, but in others it was a celebration of this crew lives. Remembering them 63 years after they were lost."